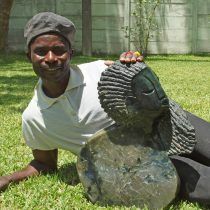 This is a very nice medium-sized sculpture by Jetro. The composition is well-balanced and there is clever use of contrasting textures, where the original surface of the raw stone which has been waxed to enhance the colour, and the material itself is full of interest. 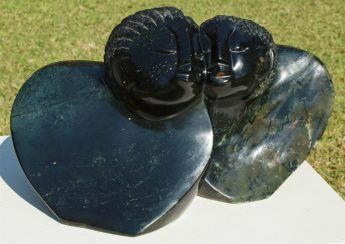 ‘Fruit serpentine’ is the local Zimbabwean name for this very colourful, slightly translucent type of serpentine stone.